When an organisation decides to change its current workspace – be it a complete relocation or a move within the existing building – it can be a time of excitement or dread, depending on the role of the employee. If you are tasked with managing the relocation whether it’s the first time or you are seasoned facilities manager, any of our 50+ Commercial Moving Group (CMG) Members can help you not just avoid costly mistakes, but also share the weight of responsibility for the project. Critically, in choosing a CMG Member for your commercial relocation you can have complete confidence not just in your decision, but also in their ability to deliver what is agreed, and often more besides! While most BAR members are able to provide a wide range of moving services for commercial and office relocations, the Commercial Moving Group (CMG) is a specialist sub group of BAR set up for that very purpose. 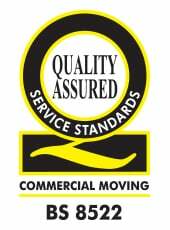 All CMG Members can demonstrate this dedication by working towards and successfully attaining BS 8522 – the British Standard for Commercial Moving. Has passed an annual external audit to ensure all standards of service are being met. POST-MOVE: The follow-up, which includes quality measurement and the remedying of any shortcomings. Within the CMG is an enormous wealth of knowledge and experience. From your initial enquiry through to the completion of the undertaking, choosing a CMG member to assist you during the relocation means you can benefit from their extraordinary depth of expertise and skill. They will assist you every step of the way, enabling you to plan and execute your move with the minimum of downtime and disruption to the business. Exploit this experience; CMG members will have carried out hundreds if not thousands of relocations so it’s unlikely they’ll come across a situation they haven’t dealt with before and in the event that they do, they’ll be able to call on similar experience to remedy the situation. Remember it’s how a service provider copes with adverse situations that lets you know you’ve chosen the right mover. Choose a CMG member and you’re in safe hands whatever happens. 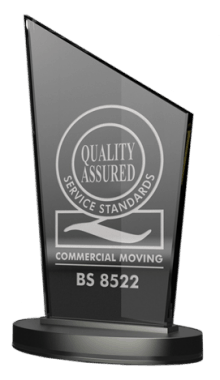 Do you hold the BS 8522 Commercial Moving Standard? There’s no better proof of a commercial mover’s ability to successfully carry out the project you set them. This should be the minimum requirement on any a Commercial Tender document for further participation. If you have a definitive date or dates with no opportunity for change, check early on that the mover is able to meet the schedule. The remit for a commercial move is incredibly wide, and a company that excels in office relocations may not have the skills, knowledge or equipment to carry out a library or factory move. Ask for the mover to demonstrate their experience that matches your need, providing testimonials or reviews if possible. Incredible as it may seem, some companies that carry out commercial and office moves only offer Mon-Fri 9-5 working hours. By necessity most commercial moves need to take place – at least partly – out of office hours and during weekends, so the organisation is up and running come Monday morning. This is standard for all CMG Members. For commercial moves it’s essential that your mover has the right insurance in place including public liability, employee liability and goods in transit and storage cover so that most any eventuality is covered at every stage of the move. Depending on your move you may need other cover so it’s worth asking. Will I have access to a dedicated Project/Relocation Manager? They will put together the strategy with you and will be your key point of contact before, during and after the move. They will be your saviour throughout the move process. Do you offer packing and unpacking? As well as providing you with the right sort of crates, boxes and protective materials the mover should be able to offer packing and unpacking services, at a time to meet your needs. How will you handle our IT equipment and Systems? This is of course critical; without seamless IT integration most organisations won’t be able to work. They will either provide it directly or work with experienced partners who can ensure this is taken care of, from decommissioning to recommissioning and every stage in between. Are you able to dispose of unwanted furniture or IT equipment? Every CMG Member can advise you on the best method of disposal of your redundant furniture or IT equipment. This could be either to re-sell, recycle or donate, with the main aim being to reduce or completely negate the chance of it being sent to landfill. Once collected and responsibly recycled or resold your CMG Member will provide you with a certificate measuring your particular project against good practice standards. Can you help us with shredding paperwork? All CMG members are required to have an Environmental and Waste Disposal Policy in place, with many of them certified to BS EN 15713 the European Standard for Secure Destruction of Confidential Material. The majority of commercial movers will be able to offer inexpensive storage should you need it prior to the move, or if you need to create space for an internal refurbishment or restructure. What are your procedures if there’s a problem? From putting right small issues to maintaining business continuity in a full disaster recovery situation, your mover should have documented processes in place. Their business is to ensure the business you work for or represent is able to carry on ‘business as usual’. Choosing a BAR CMG Member is the best way you can be sure the company you choose to move your organisation won’t let you down. 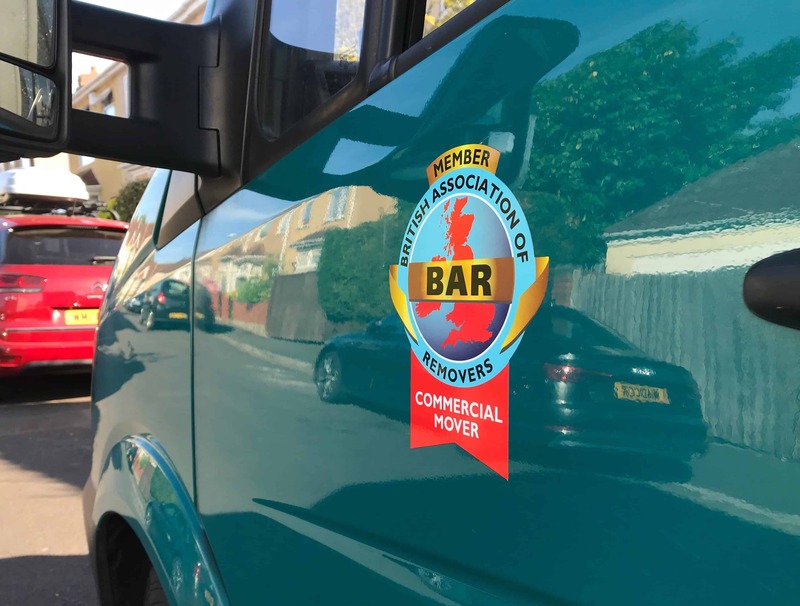 Any removal company that holds BAR membership already demonstrates that their level of service, professionalism and transparency is of a very high level, and demonstrating the level of specialism required to become a CMG Member shows a further elevation. 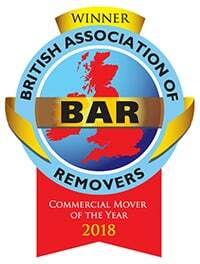 There is however always room for any company to improve and that is why each year BAR runs separate competitions for its members covering Domestic Moving, Overseas Moving and Commercial Moving. Open to all CMG Members The Commercial Mover of the Year Award (CMotY) is designed to reward best practices and partnerships between commercial movers and their clients, with each case study being judged – by an external panel – on its own merits, therefore giving every CMG Member an equal opportunity of winning this valued accolade. The finalist and the winner are announced at the Association’s Gala Dinner at the Annual Conference.